Half Saree is the only party-wear outfit that gives you freedom to experiment with your hair. From buns to pony tails, one can try so many variants of hair styles with a half saree. And a half saree will look even more heart-thumping and sensational with the following modern hair-dos that you cannot help but try. You can easily make these at home with a little help from someone and look stunning in a half saree. If you plan to add contemporary glamour to your half-drape, you can do it best with a ponytail. After pressing your hair straight, tie it in a high pony. And thus, you are ready. Pony tails have an advantage which is that they add spice to your look. At social gatherings or for office, you can look extremely scintillating with a high pony. Today, girls love messy bun. Messy buns are the new straightened hair. Pressed hair/ straightened hair have an advantage that they go well with anything. Now, messy bun can be complimented with any outfit, all you need to do is learn the know-hows. And a well-draped saree with a messy bun is the cherry on the top. If you plan to get ready for the gathering or social event by yourself seek help from a YouTube tutorial and add a classy pinch of sophistication to your attire with a messy bun. 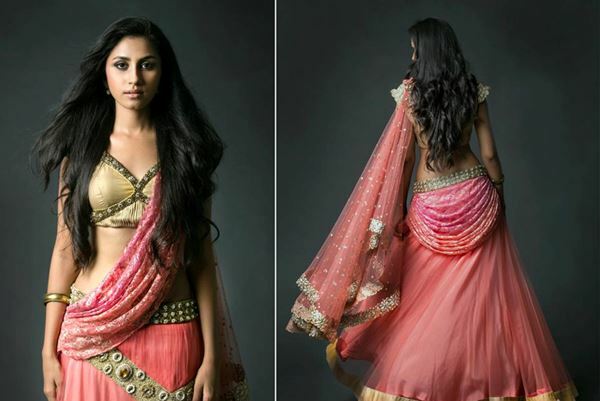 Half saree is an interesting and innovative way of draping. And a woman can make it look even better with a great hairstyle. Side-fronts is a hairstyle that goes well with every face type whether you have pear shaped face or round face. And the best part is that one can experiment a lot with side front. For instance a woman may curl her hair (as seen in picture) to eventually tie it side-front way or may switch to straightened hair for the similar look. Basically this hairstyle gives one freedom of choice. So to balance your side drape, try a side front hairstyle. Neat buns are an amazing option if you are looking for a neat and clean look for your half saree. Neat buns look classy, ravishing, elegant and breath-taking. With silk sarees and/or handloom cotton sarees, clean buns look the best. The good thing about clean buns is that they complement Indian women well. So, one needs not worry about one’s face cut. Add a small black bindi with your half saree and clean bun, and you are ramp-ready. Soft curls are beautiful. Girls with long hair also opt for soft curls when wearing a traditional outfit. And with a half saree, you will look like a princess. The good thing about a half saree is that it gives your traditional outfit a sensational contemporary look. Opt for soft curls if you fear experiments but you cannot afford looking nothing but best.